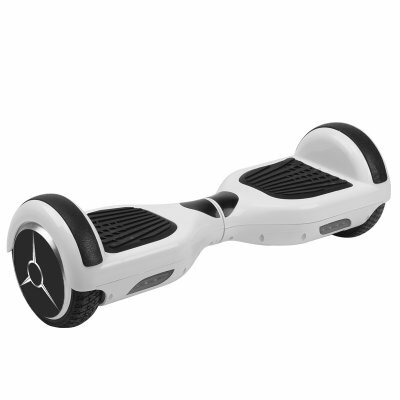 Successfully Added Self Balancing Electric Scooter 'Galactic Wheels 700' - 2X350W Electric Motors, 4400mAh, Max Load 100kg, 10Kmph Speeds (White) to your Shopping Cart. Electric rideables are the new “in” way to travel and when you can effortlessly glide to your destination in style it’s hard not to love this new technology. There have been many electric transportation devices over the last few years but the Dual Wheel presents itself as the easiest to ride and master. With built in gyroscopes the scooter can keep you balanced and upright whether standing still or cruising at 10km/h. The twin 350 Watt motors work independently to drive each wheel separate and as such this sleek style of rideable benefits from unparallel maneuverability. When standing on the pressure pads the sensors will detect your movements, so by simple leaning forward or backwards, while applying pressure with the toes or heals, you can pull of pirouettes or accelerate to a jogging pace. The large 4400mAh Samsung lithium battery lets you achieve a range of between 15 to 20km from a full charge. Designed to fill that gap between your home and the public transport link this dual wheel scooter weights just 10.5kg and is compact enough to accompany you on the bus or metro, which is more than can be said for most bicycles. When driving at night or in the dark the tail lights will indicate your presence to those around you and help keep you safe. Once you reach your destination the battery can be recharge in as little as 1 hour. So even if you have traveled the maximum range this dual wheel scooter can be ready to go again very quickly getting you from A to B in style. The 'Galactic Wheel 700W' comes with a 12 months warranty. Brought to you by the leader in electronic rideables as well as wholesale electric scooters, Chinavasion..